Fish can make as much lovable a pet as cats, dogs, and rabbits. 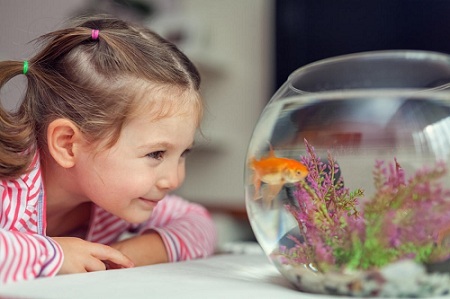 Though there are adults who love to have fish as pet, children especially love this pet. In fact, they can sit looking at the aquarium for hours. An aquarium full of fish is indeed soothing to look at. Listed down below are the top 10 kinds of fishes for kids. The Platy fish is peaceful and peace loving. There are various colours in which this fish can be found. They can be black or green or blue. Platy fish can also be seen in gold and this could be reason why most of the children mistake these for gold fish. This fish can also be found in different colours. The Molly fish requires fresh water tank and the temperature of water should be slightly above that of the normal. It likes to spend time hanging about the plant life. They also prefer little salt and thus an aquarium salt can be added to the water. But whether the salt is suitable for the other varieties should be checked. This fish is a native of South America and is a peaceful kind. They are generally docile but the males can be aggressive at times. Warm water is preferable for the Angel fish. They are more comfortable in tanks that are deeper for their structure. The Angel fish eats live or frozen fish food and fish flakes. Guppies are very friendly and must be counted under the top 10 fish for kids. They too are a peaceful kind and can be well in the company of other fish. It is good to get a handful of them because they prefer being in company. They are small and care should be taken to see that they are not eaten up by other fish. This fish can be quite easily taken care of and thus are especially loved by the children. The Gold Fish is a native of Asia and is peaceful. The fish also gets along well with the other fish. Water should be maintained at 63 degree Fahrenheit. The Beta fish is colourful and bright. They can be a little aggressive and things can complicate when two males are kept together. They can be a threat to the other fish as well. This fish has a friendly nature and can make great companions with other fish. The Blue Green Chromis is one among the top 10 fish for kids, as kids love to see the bright blue and green colours on it. Kids find the Catfish very interesting and engage to look at it for hours on the end. The richly textured body looks elegant. The Leaf Fish can be cool to look at especially because of the spotted body and its unusual shape. The fins are small and they look exquisite. The Marigold Variatus is lovely to look at. Its swift and agile movements are especially loved by children.